One of the many things that really bug me about chargers and earphones (Apple are the worst from my experience, but most phone brands tend to be terrible) is that the cords come loose at the base or split at some point after a few months. I’m sure you’ve probably heard of ‘planned obsolescence’: manufacturing a product to deliberately last only a few months or years. Nowhere is it more rife than in the technology industry. One way to avoid replacing these cords with yet more tat, is to invest in ones that are designed to last. House of Marley – I bought a pair of /house of Marley earphones a few months ago and there’s no looking back now! The wire is covered in a fabric cord rather than the rubbery plastic tube they are usually enclosed in. Not only does this mean that it is likely to be more durable over time, but you don’t get those awful tangles every time you put them away! They use recycled materials and wood where they can as well, so that’s a plus. Syncwire – my brother bought himself a pair of phone charging cords from this brand and I thought they looked cool with the mesh-like, thick casing around the wire. He told me they had lifetime warranty too and he needn’t say any more! I love products that guarantee themselves, because it says something about the quality. They do cords in a variety of lengths for Apple and micro usb port phones (most Androids). As far as perfect solutions to the phone problem goes, there are next to none. However, that doesn’t mean we don’t try to resist the current trends and vote with our wallets. Fairphone – this brand speaks to me on multiple levels. Firstly, they are basically the only brand I know of that sources its materials fairly. That in itself is amazing and commendable. Considering that the minerals used in phone manufacture are likely to be contributing to conflict in countries across the planet, hence the term ‘conflict minerals’, this represents probably the best way to show that you are against profiting from that situation. Besides that, Fairphones are modular and easy to take apart. The idea is that when one part of the phone reaches the end of it’s life or breaks, you can simply purchase that one bit and replace it yourself, diverting a whole phone from landfill which is what usually happens. Normally when a phone breaks, it costs almost as much as the selling price to replace, or there is no option for repair and you have to buy new. 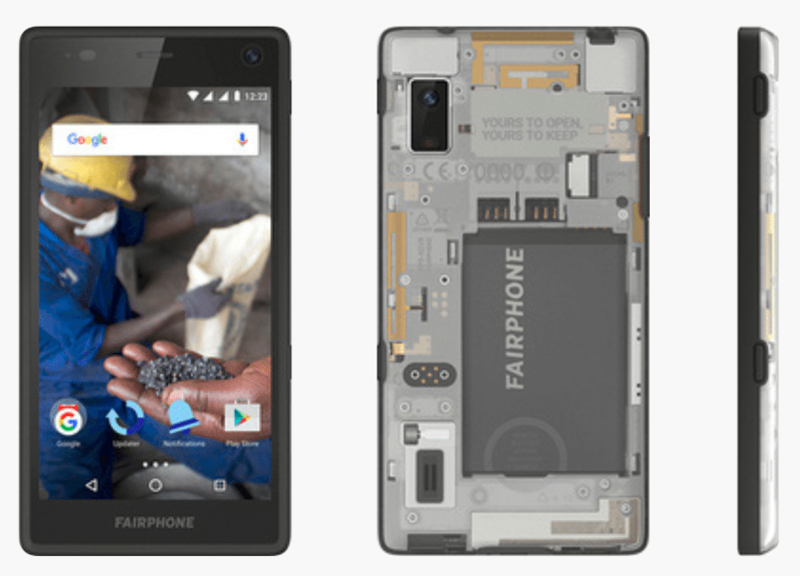 Fairphone does things differently and restores the power back to the consumer and it’s awesome. Another cheaper option is to buy a phone secondhand. Due to contracts, meaning that customers upgrade their phones annually or bi-annually (basically before it reaches the end of its shelf-life). technology moves fast, and the temptation to have the newest model is strong in much of the population. It’s just a waste of materials and energy and is a symptom of today’s consumerism which produces and sells new things at a rate that the planet can’t keep up with. You buying secondhand is obviously cheaper than buying new, and often you can find a phone with little to no problems (because it was likely just discarded due to an upgrade rather than fault). You would be using something already in circulation rather than encouraging the production of more new things. Here’s an example of a UK shop shelling refurbished phones. buy only the gadgets you neeeeed – I used to have a phone, tablet and a laptop which was just silly. I’d also casually own a billion chargers and accept more willy nilly. There is no need to own more than one of something, and while we’re at it you probably don’t need all the gadgets you have. The less you have, the less you’ll need to use, charge and replace. Simple. Cut down on that usage – I’ll be honest, I’m a bit of an internet addict. I check my phone way more than I should, and sometimes I just open my laptop and do absolutely nothing cos it’s comforting. But you know what else? Whenever I find myself checking Facebook more often or mindlessly surfing the web, I also realise that I am bored or sad or in some way dissatisfied. It’s emotional! Whenever I think ‘ooh Netflix will make this better’ I find myself 3 hours later feeling exactly the same (unless I watched something depressing in which case I feel worse!) I could’ve done something helpful like spoken to a human, gone for a walk, or read a book- all of which waste no energy or money, people- but that would’ve been too easy! Anyway, what I’m saying is I’m working on it, and you should too. Energy providers – Sorry, I live with my parents so I don’t know about all this stuff yet, but you can switch to renewable energy providers and it makes a big difference. You can make a substantial monetary saving whilst doing your bit and all it takes is switching providers and carrying on as normal! The easiest thing. Rechargeable batteries – I know, who even uses batteries anymore?! (except people with children and/or TV remotes, so almost everyone) Rechargeable batteries used to be a faff, but you can get USB ones now! They’ll save you money, and they’re better for the environment than single-use ones.